We can use our creative mind to post funny status messages on Facebook profile for your friends to enjoy and laugh. We can take this step further by adding funny “via text” to your Facebook status messages. This requires little technical help for implementation of funny (and custom) via text. From example: change “via web” to “via bedroom”, “via carrier pigeon” and so on. This can be done using ‘Status via’ Chrome extension in Google Chrome web browser. 1. Launch Google Chrome browser and open Status Via extension download page in Google Chrome browser. Click add to chrome button to install this Chrome extension. 2. After install, you will see new ‘Status via’ button on Chrome menu toolbar at top right. Click on that button to view pop box with Status Via options (it will take some time to appear, so have patience). 3. Click the drop down box to select the delivery method via text. There are number of funny via text options like: accident, dr. pepper, google+, harry potter, the laughing man, morse code, pony express, potato and so on. 4. 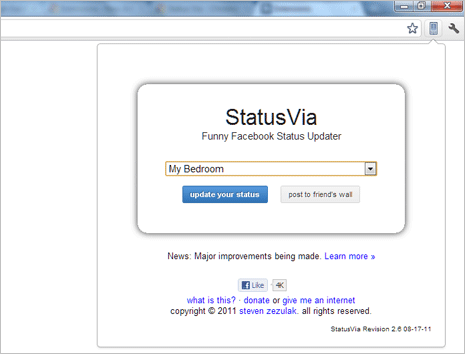 Once you make selection of funny via text option, click ‘Update your status’ or ‘Post to friend’s wall’ button options. In the pop-up box, add status text and click Share button. You will get prompt for Facebook login – if not already logged in. Now open your Facebook profile and you should see sent status message with super funny via text (like via My Bedroom as in above example). For sure one fun way to surprise friends even with sane status message text by just tweaking the via text to build up curiosity – what say? Google's Interesting Stuff at Google Store, wanna buy?